That's right. I've sold another story this week. My short tale, "Peter Piker the Pankin Man," will appear at Big Pulp later this year. I'll let you know an exact date when it draws near. My short literary story "Steven Spielberg and The Magic Box" has been accepted for publication at The Ranfurly Review. Expect to see it in June of this year! Every sale excites me, but this one has some unique things about it that's making me jump for joy. First off, this is the first time I've sold a literary story. It's also my first sale outside the United States. And ... dun, dun, duuuuuu ... this is my first sale to a publication in Scotland, the home of my ancestors! It's amazing sometimes to look back on once's writing. I've recently been putting together a package that contains some chapters from the first book in my fantasy trilogy, and when I checked the dates for each file on the computer I realized I had not worked on any of that first book in a year and a half. I've either been working on the second or third books, or more recently, short stories. Some of that first book rang true to me. But some of it ... man, it stank. I think part of this is that something like three hundred thousand words later, I'm a better writer. I'm not saying I'm a great writer, but a better writer. It also dawned on me that I could sit down and rewrite parts of this first book, make it even better. But I won't. At least not for now. Why, one might ask? It's not necessarily laziness, though I am busy with other things at the moment. It's because that first book is already on its fourth or fifth draft, and while it could be better, I know I have to set it aside at some point. If I spent the next few months making that first book better, by the time I finished, I'd have to start over again. I could keep improving that book forever. So, for now, I'm saying enough is enough. That book is going to have to stand as it is for the time being because ... well, because it has to. Sooner or later you have to throw your babies to the wolves and hope for the best, and that's kind of what I'm doing. Now, if an editor or publisher at some point wants me to make changes, that's a different thing. But until then, or by some miracle I run out of other writing project, I think that first book ("City of Rogues") is going to have to stand on its own. John Dee sees publication for the very first time! My flash story "Walking Between the Rain" is now up at Every Day Fiction. Check it out, rate the story, leave comments and enjoy! Jeff Draper is writing reviews for each short story in The Return of the Sword. Check out his review for my story "Deep in the Land of the Ice and Snow" right here. Talebones sci-fi and dark fantasy magazine is in the middle of a subscription drive. Apparently things aren't quite desperate yet, but they need some help. So, if you can, get a subscription. If you can't afford, at least try to pass along the word. Read more about this from publisher Patrick Swenson. Notes: Been a while since I've read some Salvatore, so I'm in the mood. Also, this appears to be a sequel of sorts to his The Highwayman book, which I enjoyed a couple of years ago. Mini review: The first half of this one is somewhat confusing because there are so many different characters, but they all come together in the last hundred or so pages for a pretty darn good ending. The main protagonist of this tale, Bransen (also known as the Highwayman), from time to time shows a few of Drizzt's more annoying characters such as overthinking about himself, but in the end Bransen would do any Sword and Sorcery protagonist proud. 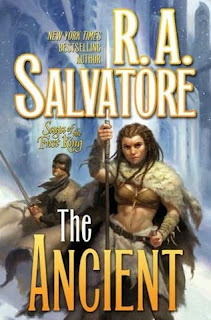 I wouldn't say this is Salvatore's best work, but it's far from his worst, and a decent read. I also like the Highwayman character quite a bit, so I'm looking forward to more tales featuring him. Following some advice from a handful of authors who have "made it," I recently began to query agents. Okay, let me rephrase that a bit. I didn't exactly send agents a query letter. Instead, based upon the advice of others (some personal and some just stuff I read online), I put together a promotional package for the first book in my trilogy, "City of Rogues." This promotional package does not include a lot of the things normally sent in a query letter. I did not send mult-page samples of writing from the book. I did not include a synopsis of the novel, nor of the trilogy. Heck, I didn't even include an SASE, which I realize is a huge no-no. What I did include were four simple pages. The first page was a short, 200-or-so word, example of the writing in "City of Rogues." The second page was a brief overview of the main three characters in the book ... Kron, Randall and Belgad (which makes me feel a little bad since all of them are male ... Adara is in the book, but she's mostly a secondary character until the second novel). The third page is a bio of myself with a photo. The fourth and final page is a little bit of marketing speak and the actual request for representation. I didn't include an SASE because, in the words of another writer though I can't remember which one right now, "an SASE is just an excuse to turn you down." So, am I doing the right thing by going against the grain? I don't know. I wanted to do something to stand out a little, but I didn't want to do anything too crazy. And the promotional package, I'm hoping, shows I have a little flair for marketing my own product. But, here's a funny thing ... though I've not received a lot of positive contact from agents so far (though I've received some), I have gotten back quite a few e-mails from agents. And none of them have been nasty. Not a one of them has said, "Hey, loser, were not representing you because you didn't include an SASE!" In fact, I'm quite happy to hear from an agent even if he or she is turning down my request for representation. Why? Because it means somebody at their agency took the time to at least glance over my proposal. AND, for good or ill, they took the time to respond. How do I know someone had to look at my proposal? Because my e-mail is on the very last page at the bottom. So, they had to get that far. I guess it's possible they could've just skipped through the first three pages, but I find that unlikely. If they were going to do that, they probably would have just thrown away my stuff. I'm sure there are some agents who have just thrown away my package, but that doesn't bother me. I understand it. I just hope I haven't burned any bridges by not being conventional. More than likely any agents not interested probably won't remember my name anway, but you never know. As for future proposals, I think I'll keep doing what I'm doing. I'll keep sending out my promotional packages instead of the standard query letter. I think it's working. Only time will tell. I received the e-mail tonight. After only one issue, Noctem Aeternus Magazine is no more. Which is too bad. Editor Michael Knost had a good product which was free and had 6,000 subscribers. But keep an eye out. He says he will still be around, taking part in the horror writing biz. So, maybe he'll have an anthology or three someday or he'll start another mag. For now, Noctem Aeternus will be missed. In two years, 2010, the World Fantasy Convention is coming to Columbus, Ohio, a city only a four-hour drive from me and a city I'm very familiar with (I lived near it for about 10 years). Two years. That's two years I have to get my writing to a level where I would feel totally comformtable going to such a large, famous event. I'm working on it. And now I have a timetable. Perhaps I'll see you there. Every Day Fiction, at last! I've finally managed to sell a story to Every Day Fiction! This is a flash fiction market I've been trying to break into for some little while now, so I'm glad to finally place a story with them. The story is titled "Walking Between the Rain," and it's one of my John Dee tales. Sign up for a free subscription to Every Day Fiction and you'll receive my story in your e-mail on March 21! The "Return of the Sword" anthology from Flashing Swords is now available in pre-orders for the price of $14.00. And shipping is free! You can purchase the anthology right here. My short story "Deep in the Land of the Ice and Snow" is available in "Return of the Sword," so make sure to let me know what you think about it. Gary Gygax, one of the creators of the fantasy role-playing game Dungeons & Dragons, has passed away. Mr. Gygax is mainly known for his part in creating D&D, but he also helped created a handful of other games and was also a novelist. While many writers might not consider Gary's death of much import, and I personally can't say I followed his life or was a huge fan, I feel it is important to keep in mind what an important role he played in modern fantasy ficiton. Without D&D, we might not have much of the fantasy fiction we enjoy today. There might not have been Lord of the Rings movies or a George R.R. Martin. Many, many people have been influenced by role-playing games and more specifically D&D, including Peter Jackson and even Stephen Colbert. My very first John Dee short story, "Beneath a Persian Sun," has been accepted for publication in the Carnivah House anthology, "The Infinity Swords." I'm very proud of this for two reasons. First, I know the Carnivah House folks and it makes me glad I could supply them with fiction they can enjoy. And that they find it good enough to pass along to their readers. Second, and I say this with modesty, I honestly believe "Beneath a Persian Sun" is the best story I've written in years. Maybe as long as 10 years. Yeah, that long. That's not saying I haven't written anything else I've liked, just that this particular story really stood out for me. So ... yippee for me! And yippee for John Dee!